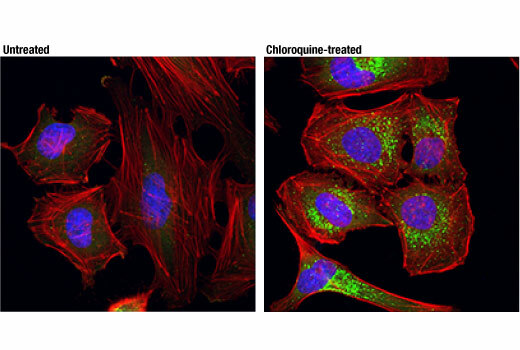 Confocal immunofluorescent analysis of HeLa cells, untreated (left) or treated with Chloroquine #14774 (50 μM, 24 hr; right), using SQSTM1/p62 (D5L7G) Mouse mAb (Alexa Fluor® 488 Conjugate) (green). Actin filaments were labeled with DyLight™ 554 Phalloidin #13054 (red). Blue pseudocolor = DRAQ5® #4084 (fluorescent DNA dye). SQSTM1/p62 (D5L7G) Mouse mAb (Alexa Fluor® 488 Conjugate) recognizes endogenous levels of total SQSTM1/p62 protein. Monoclonal antibody is produced by immunizing animals with a synthetic peptide corresponding to residues surrounding Pro220 of human SQSTM1 protein. This Cell Signaling Technology antibody is conjugated to Alexa Fluor® 488 fluorescent dye and tested in-house for direct immunofluorescent analysis in human cells. This antibody is expected to exhibit the same species cross-reactivity as the unconjugated SQSTM1/p62 (D5L7G) Mouse mAb #88588. Sequestosome 1 (SQSTM1, p62) is a ubiquitin binding protein involved in cell signaling, oxidative stress, and autophagy (1-4). It was first identified as a protein that binds to the SH2 domain of p56Lck (5) and independently found to interact with PKCζ (6,7). SQSTM1 was subsequently found to interact with ubiquitin, providing a scaffold for several signaling proteins and triggering degradation of proteins through the proteasome or lysosome (8). Interaction between SQSTM1 and TRAF6 leads to the K63-linked polyubiquitination of TRAF6 and subsequent activation of the NF-κB pathway (9). Protein aggregates formed by SQSTM1 can be degraded by the autophagosome (4,10,11). SQSTM1 binds autophagosomal membrane protein LC3/Atg8, bringing SQSTM1-containing protein aggregates to the autophagosome (12). Lysosomal degradation of autophagosomes leads to a decrease in SQSTM1 levels during autophagy; conversely, autophagy inhibitors stabilize SQSTM1 levels. Studies have demonstrated a link between SQSTM1 and oxidative stress. SQSTM1 interacts with KEAP1, which is a cytoplasmic inhibitor of NRF2, a key transcription factor involved in cellular responses to oxidative stress (3). Thus, accumulation of SQSTM1 can lead to an increase in NRF2 activity. Kirkin, V. et al. (2009) Mol Cell 34, 259-69. Seibenhener, M.L. et al. (2007) FEBS Lett 581, 175-9. Komatsu, M. et al. (2010) Nat Cell Biol 12, 213-23. Bjørkøy, G. et al. Autophagy 2, 138-9. Joung, I. et al. (1996) Proc Natl Acad Sci U S A 93, 5991-5. Sanchez, P. et al. (1998) Mol Cell Biol 18, 3069-80. Puls, A. et al. (1997) Proc Natl Acad Sci U S A 94, 6191-6. Vadlamudi, R.K. et al. (1996) J Biol Chem 271, 20235-7. Wooten, M.W. et al. (2005) J Biol Chem 280, 35625-9. Bjørkøy, G. et al. (2005) J Cell Biol 171, 603-14. Komatsu, M. et al. (2007) Cell 131, 1149-63. Pankiv, S. et al. (2007) J Biol Chem 282, 24131-45.